The 4th AUSKF Open Junior Kendo Championship was held in Las Vegas. Amazing 275 Junior kenshis came from all over the United States. At the place for the championship, there were booths for photo-shooting by professional photographers, E-bogu, and other Vendors selling shinais and bogus. It was more lively and exciting then last year! The opening ceremony started with the words "The party has just begun! ", followed by the music 'Gangnam Style' by Psy, and Junior kenshis holding signboards marched in. The audience was completely different from audience in Japan, screaming and high-fiving when their teammates came in. After the National Anthem sung by kenshis representative and words of welcome and precaution, there was a demonstration of Nihonn Kendo Kata, then the championship started at 8:30 AM. Individual and group matches finally finished at 6:00 PM. 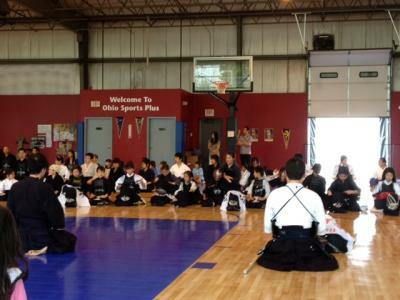 From the Columbus Junior Kendo Club, Tomohide and Takahide Katayama participated in individual and group matches. Tomohide Katayama entered best 8 in division age 10 and 11.